Magnetic Fields reverberated its way on to my radar back when I was in India last year as a load of people I met through working on GOAT festival had been and come back to Goa raving about it… A weekend music festival set not just in a palace, but in a palace in a desert in India, sounded like something I needed to tick off my list. Then after reading a feature about it in the Transform: Festival Journal this year I decided to work it into my travel plans…. 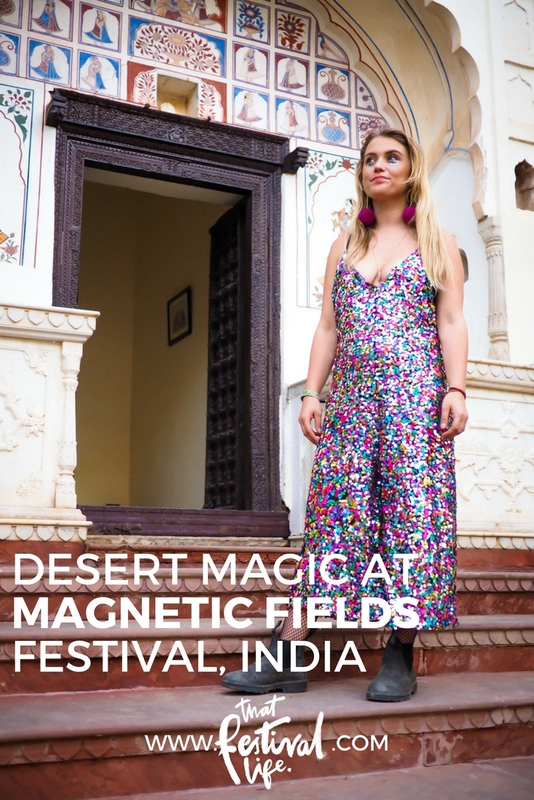 Magnetic Fields is a three day festival set in a 17th century palace in the middle of the desert in Rajasthan. Now in its fifth year it attracts 3000 revellers and world-class artists from around the globe to Alsisar Mahal, a beautiful palace turned five star hotel, and the desert area that surrounds it. It was started by by Wild City co-founders Sarah and Munbir Chawla but, integrally, exists with the full backing and co-operation of the Prince of the palace himself Abhimanyu Alsisar… who, by the way, is such a dude! He got seriously involved all weekend, we spotted him deep in the rave at 8am on Monday! 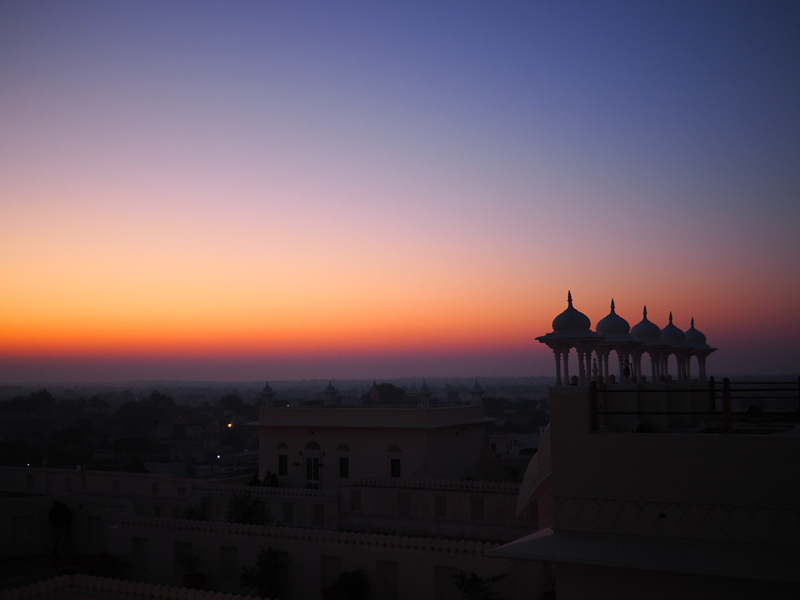 Check out an interview with the Rajput of Alsisar here. In the desert area glittering up a new pal, wearing Dulcie’s Feathers recycled silk sari kimono. 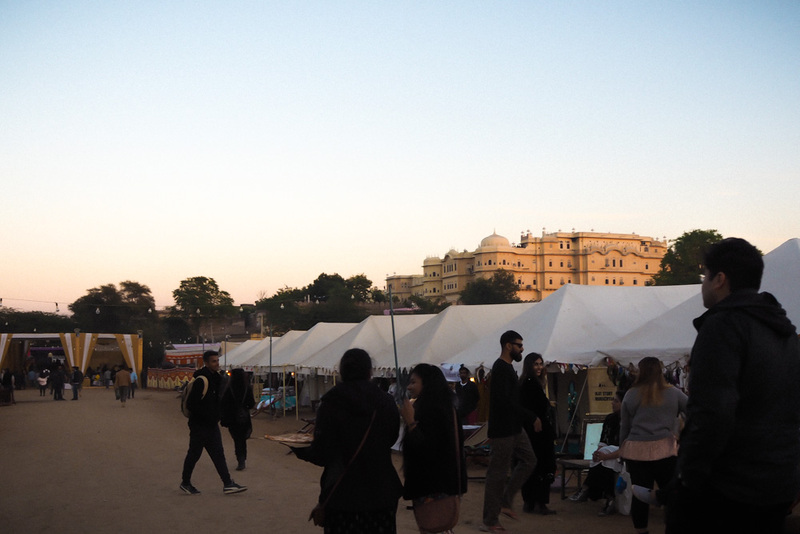 In many ways Magnetic Fields was exactly as I had imagined… It was very trendy with the crowd being predominantly made up of chic Indian music heads who had travelled from the cities, Delhi, Mumbai and Bangalore, and a smattering of other travellers in the know like ourselves. The stages and site were very slickly produced with a lot of obvious brand partnerships and sponsors which, though I understand the necessity of, is something I usually hate. However within the setting it was surprisingly unobtrusive. Each stage had a brand sponsor, Red Bull, Bira 91, Renault… but props to the Magnetic Fields team because it was done super classily. With its sponsors, hipster crowd and the fact that the price tag is out of the range of most Indians (we paid the equivalent of about £200 for our final release tickets and the most basic tent package… cheap by European standards but pricey in India) Magnetic Fields could be seen as pretty elitist… However, one of the main things that struck me was how aware and conscious the festival was of its context and setting. I felt like everything had been curated so that modern and historical, global and local could slot alongside each other harmoniously. Notably there was a photography exhibition from ‘Photographing the Female‘ on display around one of the pool areas that had involved many women from the local area. Additionally there were traditional Rajasthani musicians playing impromptu acoustic sets on the rooftops and around the palace. A special one-off audiovisual show ‘Different Trains 1947‘ was performed on the main stage on Sunday night – it was produced by both Indian and UK artists and historians as part of this year’s UK-India year of culture and dealt with the events of Indian independence in 1947 in this, the 60th anniversary year. 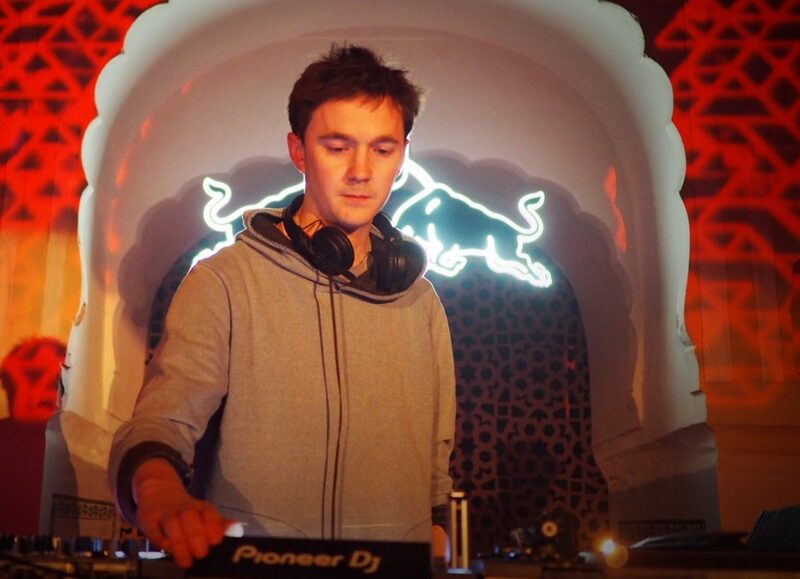 When it came to the line-up and music programming there was a palpable feeling of excitement surrounding upcoming sets all weekend – acts like Four Tet and Ben UFO that we’ve been able to catch several times in the UK are a treat to a niche crowd in India for whom this is a much rarer opportunity. I wouldn’t say I was headsy in the slightest but I’ve always felt (in a weirdly hypocritical way) that events that people flock to for the sole reason that they are genuinely madly passionate about the music make for the best vibe and this was very true of Magnetic Fields. Jayda G ft lasers & projection mapping on the palace! Jayda G was the first set we saw on Friday night and it was great to get warmed up to some disco watched from up on one of the palace balconies – that woman has so much ENERGY! The wonderful Sandunes played a live set on the a rooftop as the sun was setting on Saturday night which was pretty magical, doubly special as I missed her at GOAT due to technical difficulties. I had a some kind of semi-spiritual moment at Ben UFO‘s set on Saturday night which may have been down to a few too many GnTs but I can’t be sure. 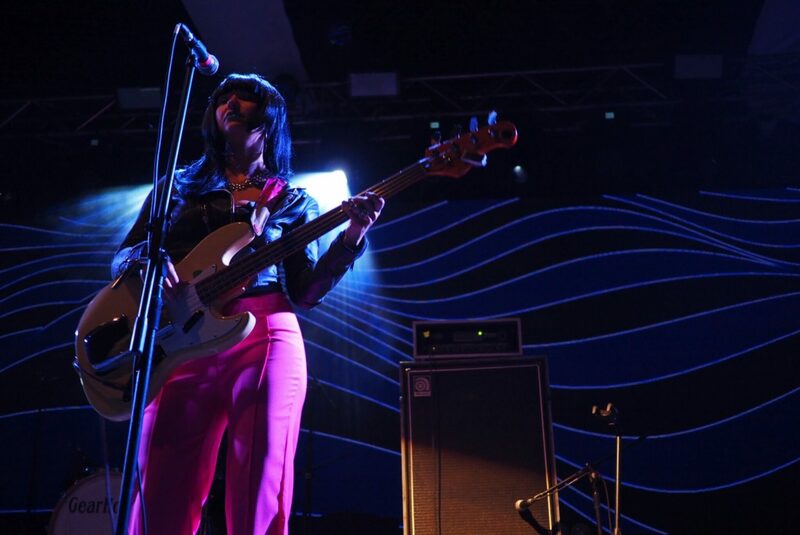 We’d been waiting all weekend for Khruangbin and as one of the only proper live acts I saw, they didn’t disappoint… perfect chilled vibes for a Sunday night. Number one musical moment for me was 100 % the ‘secret set’ on Monday morning… rolling out of the tent after a little half an hour disco nap to witness Ben UFO back to back Four Tet shelling out the jungle in the sunrise was what I’d been waiting all weekend for… and was probably my biggest festival highlight of the entire year! As well as music there were other activities to round out that festival experience. There was a wellness area including free activities such as massage workshops and yoga… we probably could have benefited a lot from a bit of this soul nourishing but we didn’t partake in that area this year! There was art, installations and live painting all over the site… not quite the immersive level that we’re spoilt with at festivals in the UK but enough to add some interest when exploring the site and to compliment the gorgeous setting perfectly. The setting was definitely my favourite aspect of the festival. The palace was completely free to roam around as we desired, with balconies we could watch the main musical areas from and beds on the roof tops you could laze around in the sun on. From a mosaic tiled restaurant on the top floor where you could chill on sofas and have some dinner to a dungeon four floors down where you could sit in a padded out cell next door to a cocktail bar! In all Magnetic Fields in succeeded in a few things… stealthily making me enjoy techno (a feat which has only been managed a few times), giving me a great tan, depriving me of sleep, introducing me to some pretty great people from all over the world… and making me want to come back next year! Sunday hangovers & a sneaky preview of the new Dulcie’s Feathers reversible silk tie back crop top! Where? Alsisar Mahal, Alsisar, Jhunjhunu, Rajasthan, India. When? Friday afternoon to Monday morning on the second weekend of December. How much? Prices start at 8,500 rs (£100). How many people? 3000 attendees. What’s on? ‘A festival of contemporary music and arts’: 3 days of live and electronic music (electronic dance music, yes but definitely not EDM !) spread across 5 stages in a palace and a desert with a smattering of art, wellness and other attractions. First time in India? Do your research! Number one: If you’re coming to India especially for the festival and it’s your first time… do yo research! One does not simply walk into India…! Magnetic Fields is a little festival bubble so the same Indian cultural norms don’t quite apply there (if there are such things as cultural norms in such a vast and changeable country) but you’re still in a 17th century palace in the middle of a desert in India so I’d definitely reccomend doing a bit of reading up! You can read my India posts here or for in depth India advice my go to blogs are Hippie in Heels & Global Gallivanting. Basically make some travel plans. The Magnetic Fields website is not hugely helpful on the subject but getting the train from Delhi as they recommend is probably the easiest option! Luckily when we finally got there the camp site reception was just a short walk from the taxi and checking in was a breeze even though it was quite late. As we all know… camping is intense.. in tents (geddit?) If you can afford it make sure that tent is one of the bedouin variety… unfortunately we opted for the slightly cheaper ‘classic tent’ package. The ‘classic tent’ area was sneakily hidden away in a cramped shanty town in the corner of the desert site so as to not ruin the aesthetics of the bedouin area and facilities included some awful toilet facilities in stand up nylon tents and bedding consisting of rock hard mats and sleeping bags… that no one told us we could rent until the second day! In contrast, the bedouin tents (which come in fancy and slightly less fancy varieties) are lussssh! They have real bedding, proper full on bathrooms, the works! You can bring your own tent and gear too but for us as backpackers that wasn’t that practical & the pitch your own tent price wasn’t that much cheaper either. If you’re feeling extra fancy you can also book your own room in the palace… but that’s kinda cheating so come on. 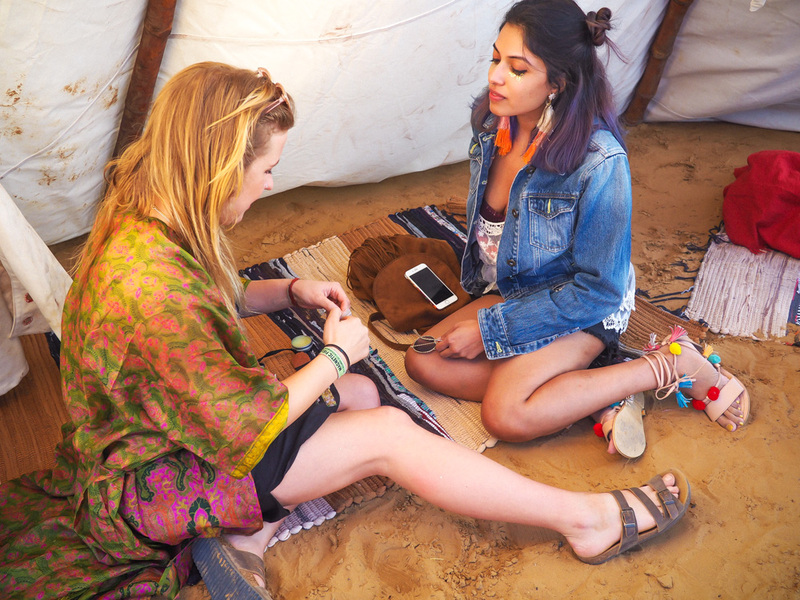 It’s not exactly Burning Man level of desert survival – but be prepared. 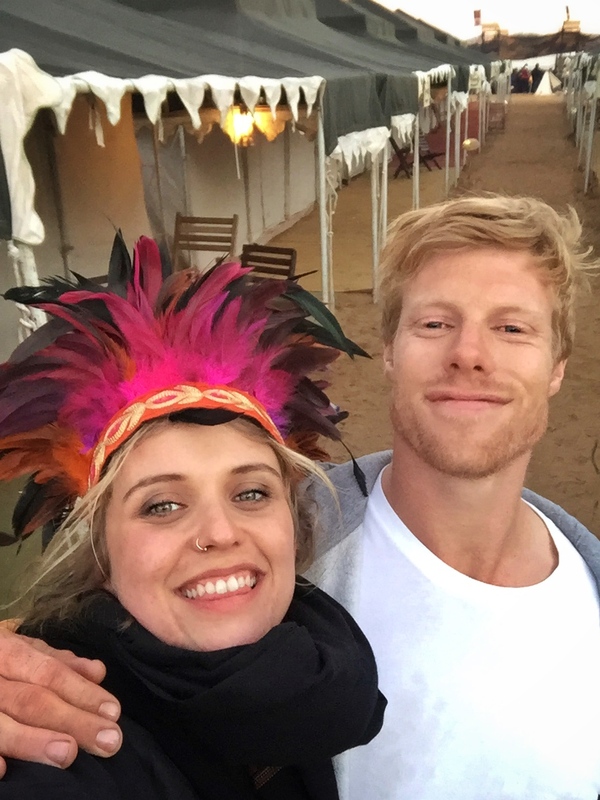 It gets COLD, at night and I mean cold – we luckily bought some huge scarves in Pushkar which were lifesavers for us but even those plus a huge hoodie, leather jacket, leggings, boots and a lot of dancing wasn’t enough on those chilly dark mornings! Luckily we didn’t ever really sleep until it was already getting light (or much at all) so we didn’t freeze too much. We never received the advice newsletter that was sent the day before the festival and only found a link to it when we were already in the taxi so the advice to bring extra warm bedding etc was sadly missed! In the day time it is hot and gorgeous as always so bring your suncream and shades. Being in the desert also means that it is obviously very dry – bring plenty of moisturiser for your face and body and carrying lip balm with you is an essential. There wasn’t a huge amount of exuberant festival fashion about but there were a smattering of quirky characters around. One of my favourite was a gentleman with a large moustache who wore totally pink every single day. Mainly everyone looked very desert chic in monochrome and linen… there was a ‘souk’ with designer clothes stalls so you could buy the look yourself! My main recommendation would just be layers & layers to take you from the hot sunny days to the cold night or just plenty of costume changes… My Blundstones were indispensable as always, I wore sandals in the day time but there were lots of little spiky burrs in the sand which we kept getting stuck in our feet so boots were better. 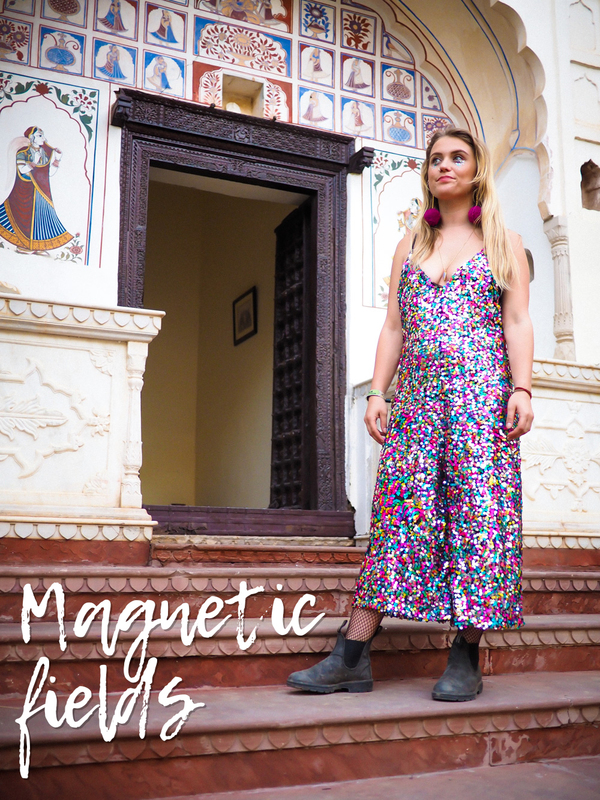 This sequin jumpsuit delight was whipped up the day before I flew out by my talented pal Rosie aka Winifred Rose, pom pom earrings as always from Zoe Zedhead! You have to get your money for drinks and food as special Magnetic Fields currency, this is really easy to do from the various ‘treasuries’ they have dotted around the site. You can swap normal rupees or use your card. Make sure you don’t leave any boogie bucks in random pockets though cause you will be annoyed when you leave the festival! I’ve got about 500 still, oops… Also make sure you bring enough real cash as we couldn’t find an ATM that dispensed this and you’ll need it for the taxi back and other things. Still would have murdered a Bloody Mary had that been an option at the bar! The food and drink selection was surprisingly excellent – pricey by Indian standards (well my cheapskate backpacker standards) but a little bit cheaper than the UK. A meal was between 300-500 rupees and a spirit and mixer was 300 whilst cocktails in the dungeon were 400 rupees which is only £5. We ate traditional south Indian dosas at breakfast with tasty iced coffees and re-energised ourselves with lovely bottled slow juices. 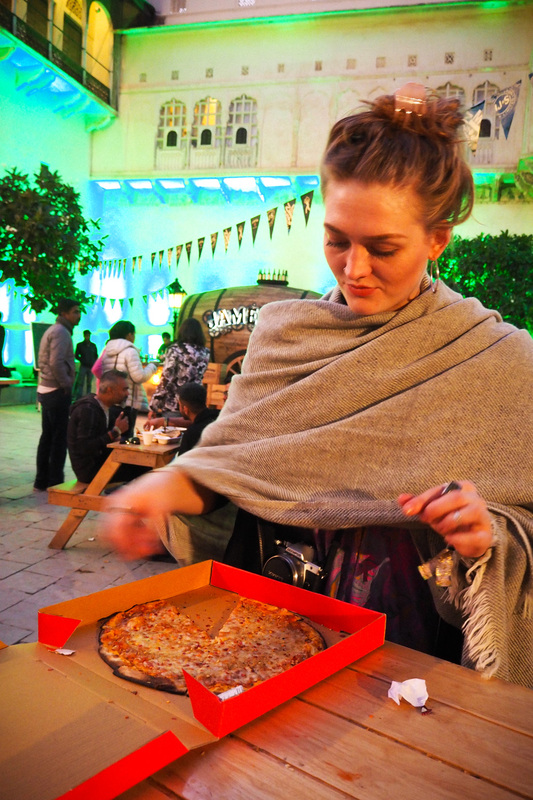 In the evenings we gorged on stone-baked pizzas and lush creamy pastas! The only think i would say was missing was anything light – little snacks and salads would have been much appreciated. There are areas to eat within the desert/bedouin tent area and well as in the palace grounds and both have the same stalls. Ear plugs are always a recommendation of mine but especially at Magnetic Fields… a plus point of having a festival in a desert is a distinct lack of sound restrictions but the downside of this is that tinnitus is for life y’all. Until I finally get round to getting some proper moulded ones I swear by my EarPeace ones – they’re comfy and have filters in so you can hear people talking to you. I also brought some spare foam ones which it turns out are indispensable for when your tent neighbour decides to start playing psytrance all morning… or the desert stage (handily situated right next to the tent area) decides to do a sound check at half 9 – ouch. There is round the clock programming but the chilly nights make you want to retreat back to the fireside or your bed at some point… the only morning I watched the sunrise properly was on the Sunday from the palace rooftop and I’m so glad I stuck it out through the cold and industrial techno because it was breathtaking! 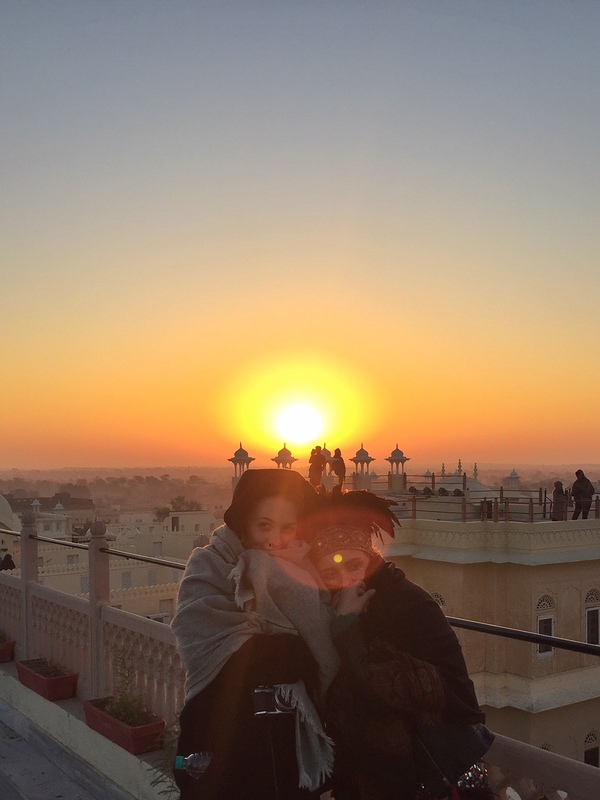 Me and Georgie snugglin in the sunrise, complete with magical bindi sun spot! 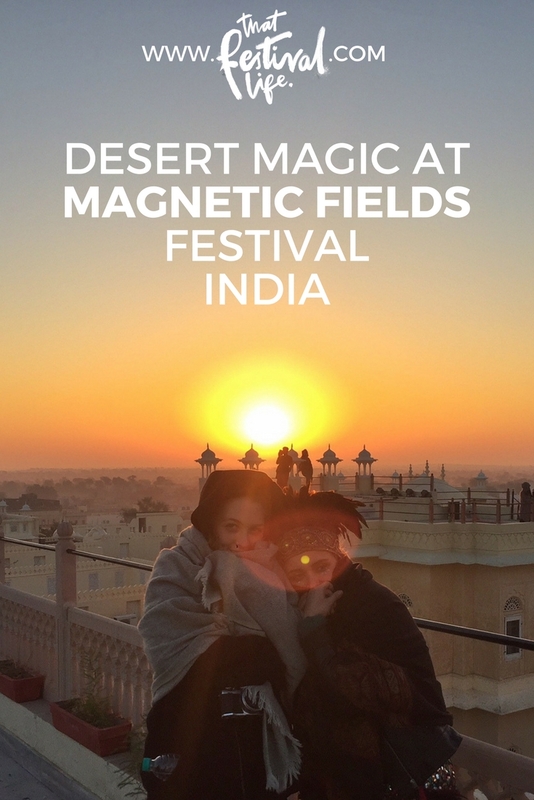 Have you ever been to Magnetic Fields or any festivals in India? I’d love to know about your experiences or if you have any recommendations! Read more of my festival posts here. I must thank my travelling companion Georgiana for taking 80% of these photos – how great are they!? My camera didn’t come out much, oops! Dulcie this post is amazing, I am so so jealous! This 100% makes me want to go next year! Reckon a ginger like me would survive? That sunrise is insane. Amazing pictures and you look beautiful ma’am. You should also try ‘Rann of kutchh’. Love the photos!!! Looks like a very fun trip ! Wish I was there ! Wow this looks like an absolutely incredible experience! What a special setting for a festival. I’m not a huge techno fan, but I could see how it would be more special in the desert. Thanks for the tips about the basic tent. My cheapskate self would have made the same decision. The blog is very helpful and boy do i love your festival gear!! A quick question – Of what I have read – a tent/camp is shared amongst two people – Am i right? and the tickets are inclusive of the camp and the festival passes. What if I travel alone? how does that cost get divided? I am a tad bit confused!